‘Grey towers of Durham, Yet well I loved thy mixed and massive piles’, proclaimed Sir Walter Scott. 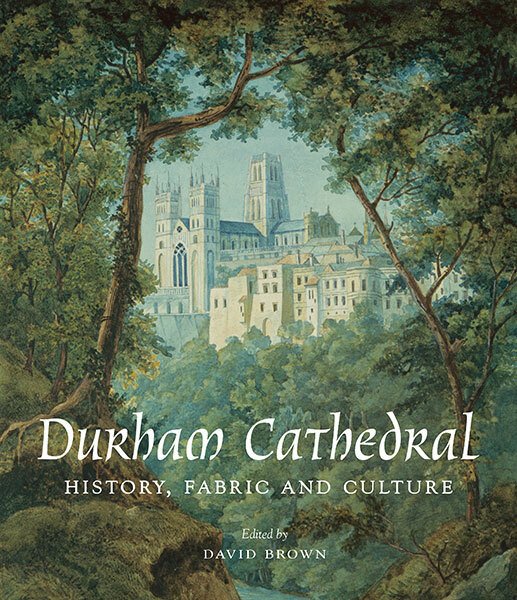 New Yale publication, Durham Cathedral: History, Fabric and Culture, edited by David Brown, explores the rich and long history of the one of the city’s finest buildings. The main Cathedral, as we know it today, was reconstructed after the Norman Conquest of England in 1066. It was built over a fourty-year period, under the leadership of Bishop William of St Calais, after his return from exile in the late eleventh century. Despite this Norman origin, Durham Cathedral’s prehistory dates back to earlier centuries, with the death of St Cuthbert in 687, whose relics became the focus of a popular cult in medieval Northumbria. The saint’s remains were translated to an earlier church in Durham during the late tenth century before finally moving to the Cathedral in 1104. It is this early history that marks over a millennium of the changes and developments of Durham Cathedral covered in Brown’s book, which is possibly the most comprehensive publication dedicated to the church yet. This extensive survey contains essays by 37 different authors focusing on topics as diverse and broad as Cuthbert’s early-Medieval origins, twentieth-century art within the church and the Cathedral’s relationship to its surrounding landscape. The Cathedral itself is noted for its impressive rib-vaulted ceiling above the nave, an architectural motif that was innovated during the eleventh century. This feature, as well as the half-arches over the galleries above the nave, have the led to elements of the Cathedral’s architectural style to be labeled as ‘proto-Gothic’ by some modern scholars. There are later additions to the Norman structure that are more typically Gothic in style and date from the thirteenth to fifteenth century. These subsequent extensions and alterations include the new eastern transept, known as the Nine Altars Chapel, and the western and central towers, all of which display the Gothic emphasis on perpendicularity, drawing the viewers eye up towards the heavens. The rich and complex architecture of Durham Cathedral and its geographical setting towering above the River Wear has led to its subsequent depiction in art from as early as the seventeenth century. The most notable representations of the Cathedral date to the nineteenth century, with artists such as J. M. W. Turner choosing it as a subject. Here the artist depicts the Cathedral from the vantage point of Prebends’ Bridge, above the Wear, in a typically Romantic style, favouring emotive colour and abstraction over topography. Romanticisation of the Cathedral and its location are also visible in Felix Mendelssohn Bartholdy’s watercolour from 1829, where the building is shown basking in sunlight and framed by luscious green surroundings. In the latter half of this century the Cathedral was restored under the leadership of Sir George Gilbert Scott, famed for building St Pancras station and the Albert Memorial in London. As part of this period of renovation a series of impressive stained glass windows were installed within the church, depicting biblical scenes in luminous and richly coloured light, Nikolaus Pevsner singled out the 1867 window by Clayton & Bell as an ‘uncommonly good’ example of the medium. These pieces of magnificent decoration are now accompanied by later stained glass from the twentieth and twenty-first centuries. Despite being produced in far more stylised and abstract manner these artworks invoke similar responses from the viewer as their earlier counterparts, conveying the sense of a spiritual journey that invokes feelings of awe, illumination, revelation and mystery. Durham Cathedral: History, Fabric and Culture is available from Yale. The Effects of the Crusades on the Civilization of Europe. Should the State of East Prussia be Returned to Germany?